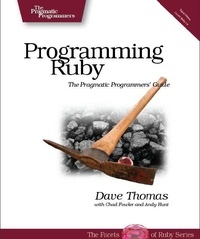 Автор: Thomas D., Fowler C., Hunt A.
Описание книги Programming Ruby 1.9: The Pragmatic Programmers\’ Guide:Would you like to go from first idea to working code much, much faster? Do you currently spend more time satisfying the compiler instead of your clients or end users? Are you frustrated with demanding languages that seem to get in your way, instead of getting the work done? Are you using Rails, and want to dig deeper into the underlying Ruby language? If so, then we’ve got a language and book for you! Ruby is a fully object-oriented language, much like the classic object-oriented language, Smalltalk. Like Smalltalk, it is dynamically typed (as opposed to Java or C++), but unlike Smalltalk, Ruby features the same conveniences found in modern scripting languages such as Perl and Python.The combination of the power of a pure object-oriented language with the convenience of a scripting language makes Ruby a favorite tool of intelligent, forward-thinking programmers.